On April 1, 1887, a Sunday School was organized with B. M. Moore as superintendent. Growing out of this Sunday School on November 11, 1888, the Simpsonville Baptist Church was organized. There were twenty-four members. The first called pastor for 1889 was Rev. F. H. Martin. The first building was built in 1889 at an approximate cost of $2,500. Services were held once per month. At the beginning of 1897, the church began to have preaching twice per month. The first parsonage was built in 1900. The church's first full-time pastorate was Rev. W. W. William who served from November 1908 until December 1911. Ground was broken for the current Chapel on April 15, 1913. The building was complete on May 2, 1914 for a completed cost, including furnishings, of $19,208. The name of the church was changed to the "First Baptist Church of Simpsonville" on March 5, 1922. The church voted in October of 1947 to build a Sunday School building. In July of 1961, a new educational building was added to be known as the "Wheeler Annex." The Webber Annex was constructed in 1974. First Baptist Church of Simpsonville was incorporated as a nonprofit eleemosynary corporation pursuant to the laws of the state of South Carolina on November 6, 1981. A sanctuary was approved for construction in July of 1982 and completed in 1984. Since the 1990's, by the Lord's faithfulness, FBCS has experienced continual growth and expansion. A Child Development Center was launched in the early 1990s, resulting in the replacement of the two-story Wheeler complex directly behind the chapel. The Hendricks/Warren Family Life Center was completed in 1997. In 2002 and 2003, FBCS offices relocated to the McDowell building on Hedge Street and the church completed an additional two-story Children's building next to the Wheeler complex. 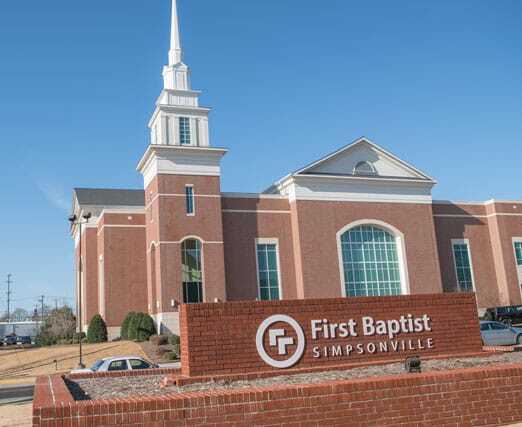 In 2005 and 2006, FBCS continued to expanded our campus presence by acquisitioning from the City of Simpsonville, SC several buildings on College Street from the former Simpsonville Elementary School complex, and opening a second location in the western suburb district of the city on Harrison Bridge Road - known as the FBCS West Campus. 2008 saw the completion of our new 1,500 seating capacity Worship Center on the corner of E. Curtis Street and Church Street in downtown Simpsonville. God is really working here. We marvel in His faithfulness and His provisions, and we feel honored to serve one another and our community in His name. First Baptist's commitment to building a missional Kingdom Cause, both locally and globally, is what guides our beliefs and principles.